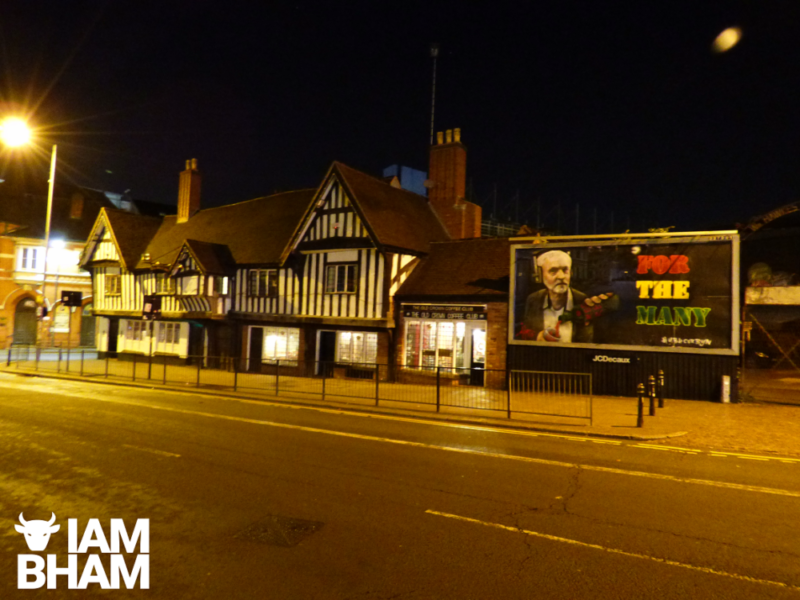 Guerilla artist Void One has hijacked another Birmingham billboard, and this time plastered it with the face of Jeremy Corbyn, as the Conservative Party conference began in the city. 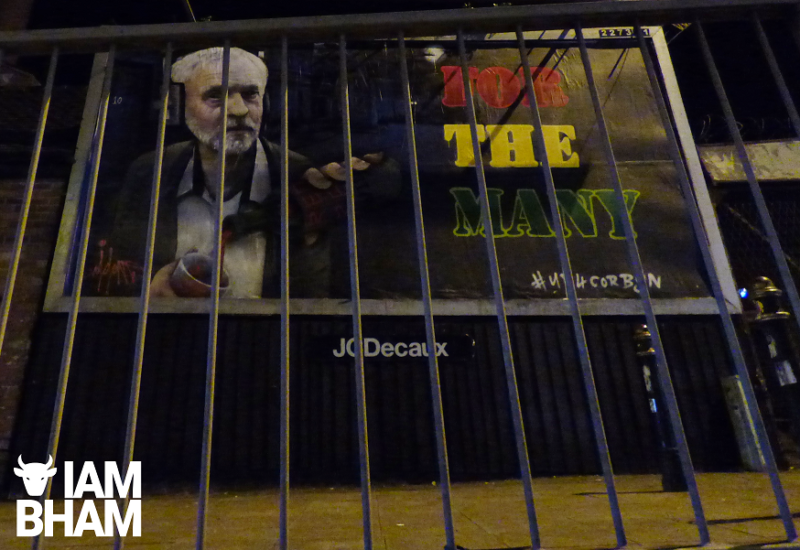 As Prime Minister Theresa May led the Tory gathering at the International Convention Centre in Broad Street, a new work of protest art went up in Digbeth, emblazoned with an image of Labour Party leader Jeremy Corbyn. 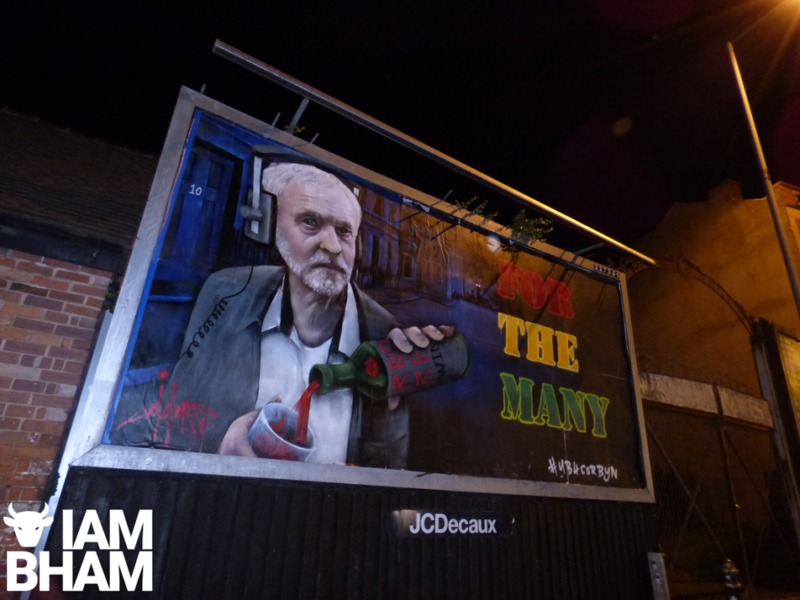 Combining Corbyn with references to local music band UB40 – including the MP holding a bottle of “Red Red Wine” – the huge billboard has been unveiled by Birmingham street artist Void One. The artist has previously told I Am Birmingham that he believes in the power of art to reach people in a very direct and visceral manner. Censorship is abhorrent to him, as he attempts to convey his political and social messages about freedom through the medium of art. Following the completion of an earlier anti-war protest piece at the Custard Factory in April, Void One expressed his frustrations at the current Government and Prime Minister. 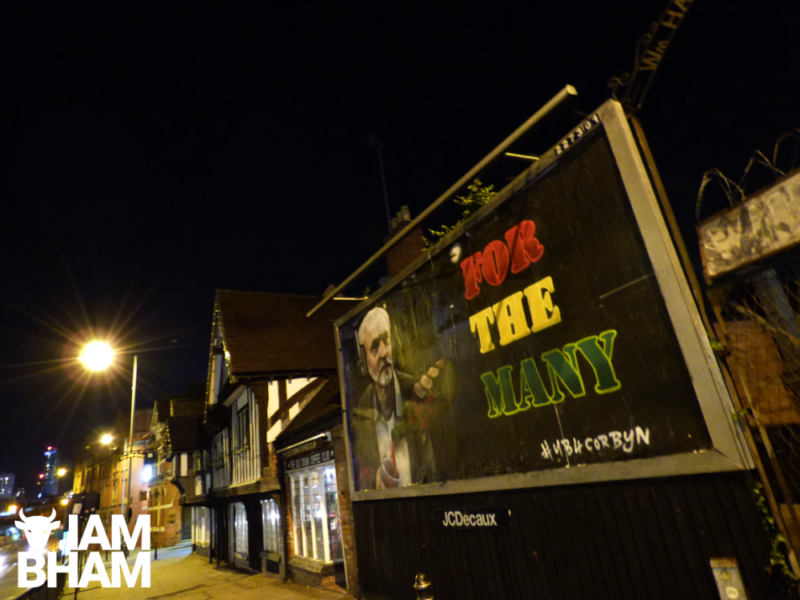 “Theresa May has no parliamentary majority, and is now sabre rattling in an attempt to cover up her shambolic record on everything from health, crime, social care, welfare, Grenfell, Windrush, the list is endless,” he told I Am Birmingham. “It’s funny, we always have money for war, 6 million for 8 missiles, but nurses have to use food banks and disabled people are killing themselves under the weight of being erroneously deemed fit to work. 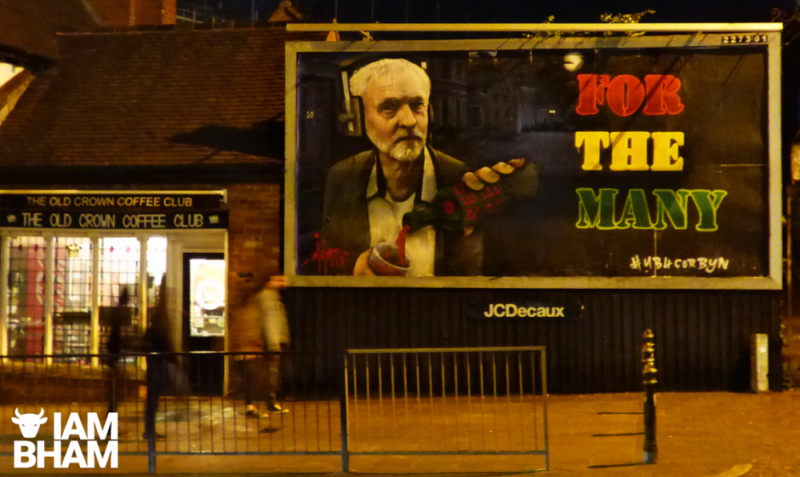 The new art, pasted onto a billboard adjacent to The Old Crown Pub in Digbeth High Street, depicts the Leader of the Opposition wearing headphones while standing outside Number 10 Downing Street. 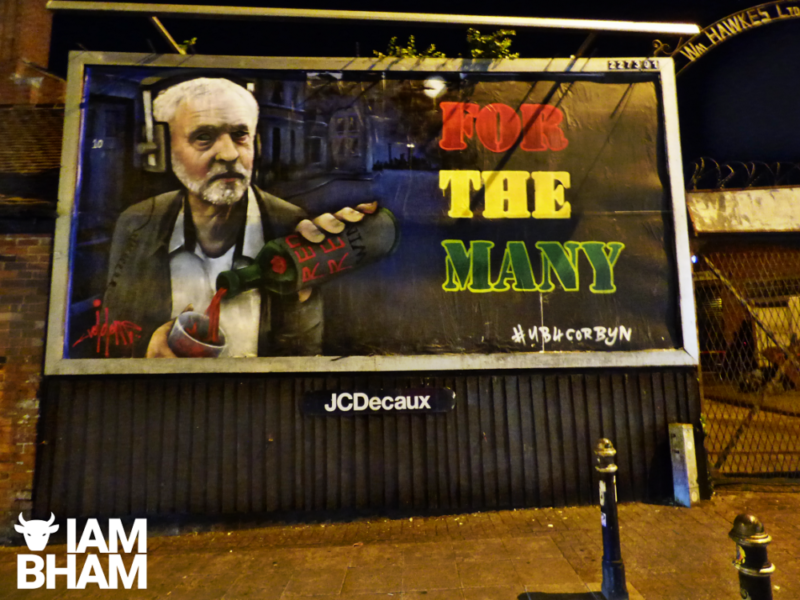 He is presumably listening to ‘Red Red Wine’ by local reggae band UB40 (the clue being on the bottle label), flanked by the Labour Party’s manifesto motto ‘For the Many’ in the Rasta-inspired shades of red, gold and green. 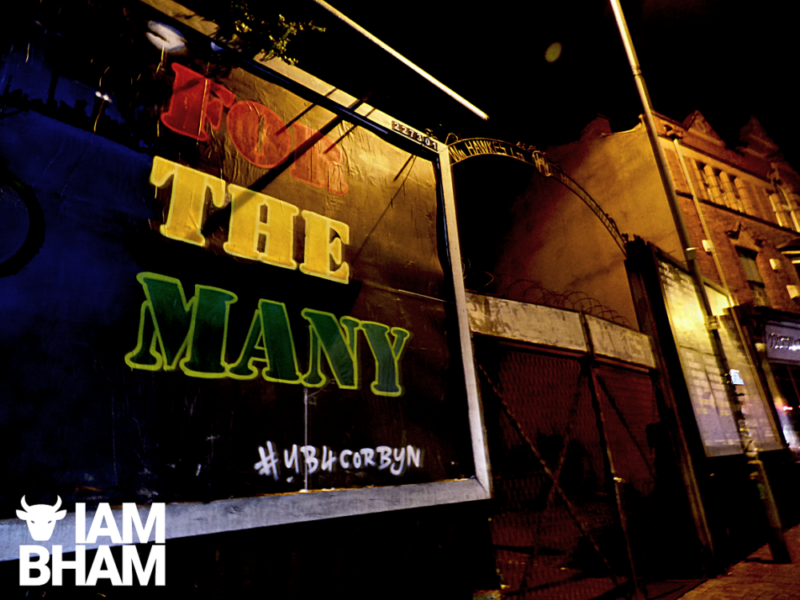 Birmingham band UB40 are vocal supporters of Jeremy Corbyn, having backed his party leadership campaign and victory in 2016. “There’s something powerful in symbolism and iconography that we can all identify with immediately, and I love to play around with that. 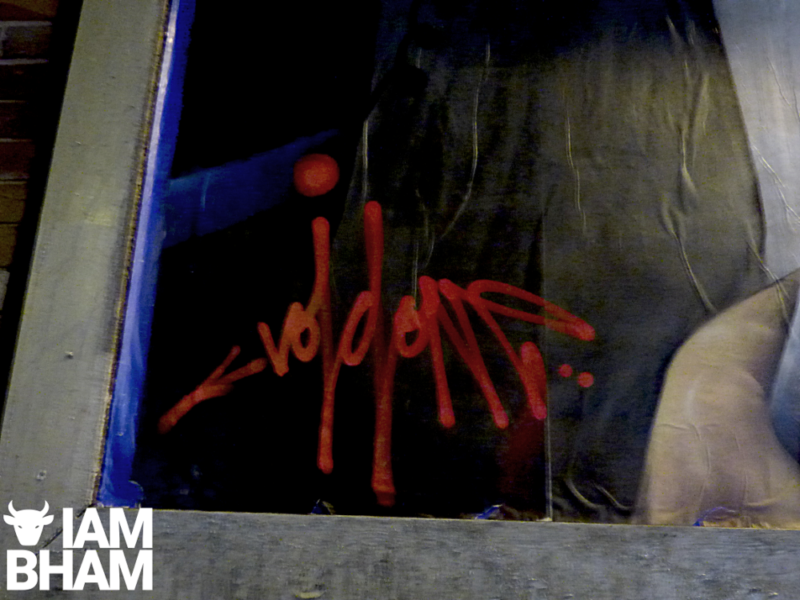 Find out more about Void One and his work at www.voidone.uk.